What's the evidence of this? Let's imagine the numbers are correct, what would be the evidence supporting this? What's below the water? The one where the whole earth is floating? You understand these landings are a secondary objetives of the missions? Correct launch windows and location of landing site depends on the primary mission which is to put something in a specific orbit for whatever reason. Flat Earth Q&A / Re: Moon Question! So the earth is flat but somehow light behaves/travels like an arc? The territory within the red "V" is what it is claimed by Chile (my country). 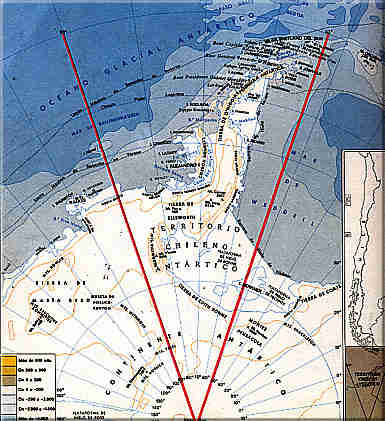 Guess where in Antártica (as we call it) are all the chilean temporary and permanent bases. You are aware a magnet can lose it's magnetism, right? Temperature it s a factor, learn about the curie temperature or curie point. I didn't hear what's the refractive index of the atmosphere they are buiding in their 3d model. That would have been of great help to do some math. The only reference to data in the video is "entered the data from the internet" and "he found out his program is capable to model the atmosphere"
I'm starting to think this could be a language barrier situation. In my language, the concept of density and thickness could be communicated with the same word. well, the investigation says that the causes of death cannot be determined considering that the forces to which the crew got exposed dfuring the ship breakup were not sufficient to kill them.And at least 3 could have survived the breakup and died once they hit th e water. Those 3 PEAPs were activated and the ais left in the tanks was consistent with the time between the breakup and the final crash of the cabin module. Also some switches were moved and their lever locks were not in the nominal launch position. SO yes, at least 3 could have not died in the explosion but a few minutes after that. And the Roger Comission included even Richard Feynman and other people not associated with the government. Stuff floating in water is buoyancy and is dependant upon relative densities. However you still cant explain why solid metals of different densities have different weights. Your explanation that different densities displace different volumes has already shown to be wrong. If they displace the same volume hen your model has them weighing the same. They clearly don't. Denpressure is why objects of different densities have different weights. It's been told to you many times. And stuff floating in water might be buoyancy but to create the buoyancy the object still has to displace the water. Now tell me why it displaces the water. What is displacing the water? Volume displaces water. If your volume is 100 cm3, you will displace 100 cm3 of wjatever the hell your are in. 2 object with the same volume can have different density. The purpose of this is not to lash out at his model or anyone's model. I find the idea of buoyancy with a Twist Interesting, if I could just put my head around the issue of "down" and why it happens. So far, all I can work out is we should be able to "swim" everywhere. Of course I hear denspressure is stupid, flat earth is stupid, really anything that goes against the mainstream consensus is "stupid" or "crazy"..These are easy examples to demonstrate either by the angry n00bs (or perma-n00bs) that frequent here alone..Not to mention in the real non digital world. Perhaps the ideas are crazy and stupid...Perhaps not...The point is this..
Don't forget what "reality" mainstream science is pushing. Imagine you were a 35 year old uncontacted tribal member, and someone came to you and told you this. 14 billion years ago there was nothing but this tiny incredibly hot spot of just a few inches that was magically there for no apparent reason. Then suddenly, it got so hot and energized that it started to expand 1000s of times upon itself. During this expansion, this magic hot spot started to create beginning elements. Then as it cooled, started to some how produce the basic elements for inanimate life all while continuing to expand. Then the earth and the sun put together figured out how to turn inanimate matter into a simple single celled organism in a hot area of water that somehow appeared. For some reason this little cell was not happy being what it was, even though it had no thoughts or desires. So, for some reason with no intelligence or desire, it blindly started attempting to turn into a multiple celled organism which it finally did. Then on down the line until it was a form of a fish. Finally, one day, this swimming creature with no intelligence, went for the stars and somehow morphed itself to get out of that pond!! Fresh air!! Finally!! Then from there went to form the millions of life forms we see with complex RNA/DNA instruction manuals including us!! Lol you would say "dafaq" Ok...I am gonna walk this way, you don't follow me. So let's not be so closed minded, judgemental, or high and mighty about other ideas. Because in reality, if you REALLY look at it with an open mind. The mainstream view is about as crazy as you can get. So how crazy and dumb is the idea we could be in a pressurized capsule again?? Big difference is that we have a theory with a mathematical model of a few of those thing + experiments that can be replicated with less than USD10, we have people studying them (me included) and from the other hand we confuse buoyancy with displacement, volume, weight and density. Here's a chart comparing Voyager 2's speed with new horizons'. Voyager had 2 big gravity assists from Jupiter and Saturn, New Horizons had a smaller one from Jupiter. 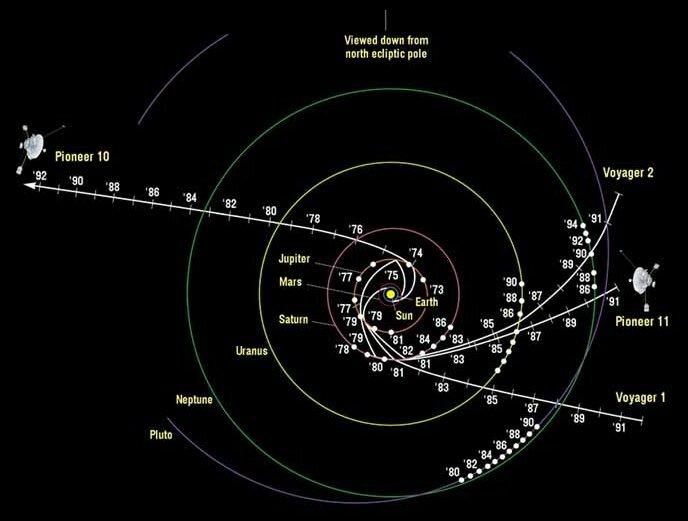 Overall Voyager 2 is the faster craft, but its route meant it had further to go before reaching Pluto's orbit. Not only that but New Horizons was the first probe to be sent straight into solar system escape velocity.None of the Voyagers and Pioneers were sent out that way. And a last minute delay of only 26 days would have made NH trip to Pluto 2 to 4 years longer. Why did Voyager supposedly take 12 years and New Horizons supposedly only 9.5 years to reach Pluto? Neither Voyager probe ever reached Pluto. The planetary alignment wasn't right for the required gravitational assist maneuvers. Actually Pluto was part of the plan, at least one of the plans. But to optimize the science in Saturn, Pluto had to be left out, to be able to do more science around Titan. And Voyager would not have been prepared to study what New Horizon saw in Pluto, so it was a good decision. That dust was a huge mistake too. Anyone who has actually observed the Moon through a telescope knows this. Have you ever noticed that no matter how much dust the astronauts kick up, there are never any dust clouds (or any other kind of clouds for that matter) in any of the moon videos? according to one of the theories here, denspressure, in the close vacuum of the moon, everything would weight more because of less buoyancy. Hence, no dust clouds. Both Voyager were focused on visiting multiple planets, taking advantage of gravitory assist fly bys. New Horizon was sent out almost a straight line towards Pluto encounter. I can select 3 random monuments and draw a circle. It will always work. Lol, this might be the most uneducated response you could offer..... well done! Ummm...that's a fact. You can draw a circle using any given 3 points in the universe. Flat Earth General / Re: Free thinking or just plain delusional? In the case of Antarctica it's quite clear it's an island on the South Pole covered in ice. Just to be fair, it is more than an isand, it is a whole continent. Saying antarctica is a island is like saying Australia is an island. Nevertheless, antarctica it is there. I'm from Chile, I've been in Punta Arenas, Ushuaia and Puerto Natales and I've taken both ships and airplanes to one of the Chilean Air Force bases over there. Never in the winter though so I havent experienced 24 hour night but I have seen 24 hour days. Flat Earth Debate / Re: Why don't sattelites fall down ? hmm..they do not burn during launch because the highest speeds are reached at really high altittude. The last burns are done even 30 to 45 minutes after launch. Also orbit positioning trajectories in some case could take a lot of days. Low energy transit to ISS could take 4 or 5 days. NewHorizon crossed the moon orbit in 9 hours. Flat Earth General / Re: No video of plane from ISS? No a lot of airplanes, but there are tons of pictures of the Soyuz entering the atmosphere taken from the ISS. Flat Earth General / Re: Hello!!! not sure if somebody already answered this, but indeed that picture is manipulated. Just check the source. This picture is actually 2 pictures into one. The one focusing on the moon made the earth too bright and the one focusing on the earth made the mooon to dark. Not saying is not true just that it is impossible to get a picture like that without sticking 2 pictures together. And I read that in the HiRise web page. Earth is round. Period. But the picture doesn't prove anaything. how about one of these...I mean, they already go through water and air. Planes flying over desert of sahara by closed radars because navigation systems doesnt work. Sorry man but I have actually being in the Sahara during the Dakar Rally lots of years ago. And GPS worked. We crossed all the way from Dakar in Senegal to Sharm el Sheik in Egypt. Why do you believe it's accelerating? Because I can feel it accelerate into me - I have weight. I understand earth is accelerating at 9.8 m per second per second. This means if we set up zero time now, in 1 second the earth will be moving at 9.8 m per second, right? Then for every second it will continue accelerating hence increasing its speed. Now, this has been hapening for a couple million years so the speed of the earth in relation to the zero time defined abone is quite fast. If the earth sun Moon system is a fixed and closed system, how come we can still see the same planets in the "firmament " for hundreds of years? Shouldnt we have moved away from them or it is the entire universe moving with the earth?